Tuesday 6th September. It could be an airport anywhere in the world but this is London Heathrow Terminal One. 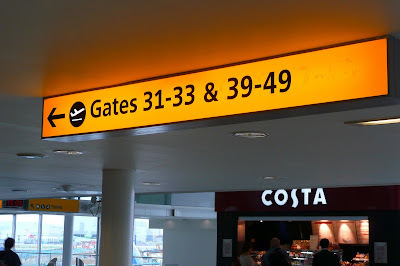 I’m on the long walk to gate 33 to board my flight to New Zealand; two hours since I left home, with over thirty hours ahead of me until I clear immigration in Christchurch. I am travelling with Air New Zealand on a brand new 7770-300. I’ve got a window seat: all the better to see the torrential rain which sweeps London and delays our start by two hours. The mood is lifted for us all by the very humorous in-flight safety video, something for which Air NZ now has quite a following: you can find them on YouTube. Finally we have pushed back from the gate, taxied slowly to join the queue for take-off, and I can count 14 planes ahead of us in the queue, a slow start to a very long haul. I’ve treated myself to Premium Economy class, where Air NZ has a new-style design and layout. More space both for legs, and side-to-side too; very attentive staff, reputedly the same food as business class, and plenty of excellent NZ wines. 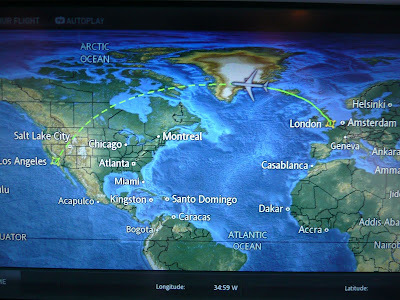 We are flying north, towards Greenland, across Canada, and down the US to Los Angeles where we change crews. This leg will take 11 hours (plus the two hour delay at Heathrow) and the first five hours are in daylight. As we are heading west, we chase the sunset which last for several hours. Not much to report about Los Angeles International or LAX as it is known. Fans of Michael Mann’s film ‘Heat’ will know it well: the final twenty minutes is shot in the outfield and taxiways of LAX, with Robert de Niro and Al Pacino stalking each other, as jumbos take off and land around them. Nothing so exciting for us. We have to ‘de-plane’, with all our hand luggage, to allow it to be refuelled, cleaned, and stocked up with more food (and wine?). Since we are setting foot on US soil we have to present ourselves to the Dept of Homeland Security: forms, passports, questions, fingerprints and photographs; weak coffee, free wi-fi, and then its back on board. My neighbour on the first leg, a Kiwi barrister working in London, has blagged himself an upgrade to business, so I have a new seatmate, a young businesswoman flying home to Auckland, trying to be there in time for her daughter waking up on what will be her second birthday. 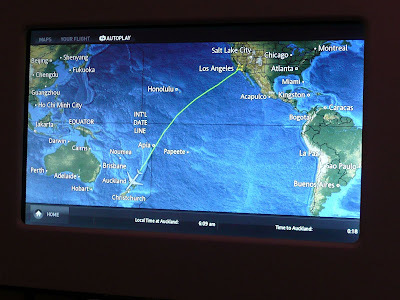 It’s an uneventful flight to Auckland, with most of it passing over water, 6,500 miles of water. 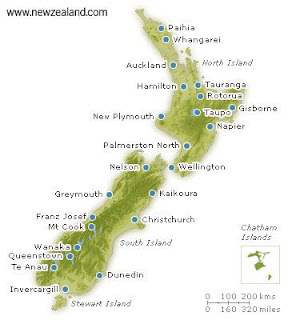 Thursday 8th Finally we make New Zealand, and have made up some of the lost time. Touchdown is at 0650 and there is just a short walk to another gate to get NZ 0303, the internal flight down to Christchurch. Again we are shown an unusual safety video, this one featuring some of the All Blacks and their coach: an effective way of getting across the message. We land at 0845 and Christchurch airport is quiet, calm, efficient, with warm greetings for the rugby fans from all security and customs staff. I’m quickly reunited with my bags, and that’s the longest ever journey complete: 34 hours since I left home. A shuttle bus runs me to the depot where I collect my campervan and after a quick run-through of the vehicle and its facilities I’m on the road. First stop is Countdown, a local equivalent of Tesco, where I want to do a general shop to stock-up with all the basics for the next sixe weeks. Unfortunately the unfamiliar layout, different packaging, and my complete tiredness, means I spend about an hour pushing a trolley rather aimlessly before I arrive at the checkout. Three more miles and I get to Amber Park, the site in Christchurch where I have planned to park up for the rest of the day. Unpack, stow away clothes and shopping, a long hot shower, and some lunch. A chat with the owner about life in the city post-earthquake, and I take a short walk to get some fresh air and stretch my legs. I’ll avoid sightseeing ‘quake damage until I return to the city in three weeks time. And finally to bed by 9pm…..zzzzzz. Friday 9th. After a good sleep, a shower and so brekkie, I’m off to my first task, getting sorted with a local sim card for my iPhone. It has already been unlocked by O2, so this should be simple… er, no. Two hours after entering a Telecom NZ shop I give up and revert to plan B (stick with O2 but be very careful with data roaming and other such costs). 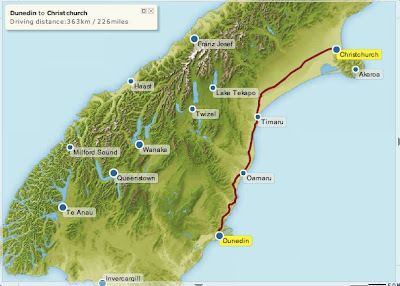 And so out of Christchurch and drive south, Highway 1, aiming for Oamaru, about 150 miles away. 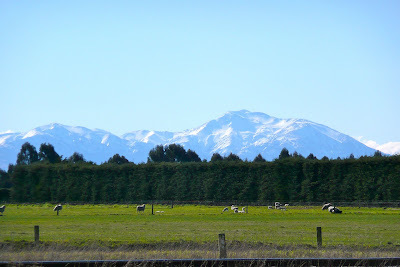 It’s an easy drive across the Canterbury Plains. The snow-covered Southern Alps are to my right, and eventually to my left the Pacific comes into view (actually the South Pacific). Highway 1 is quiet (in European terms), generally a single lane in each direction. It’s about 16 degrees, some sun, and a clear day, and I get the radio working. Lunch is my first ‘meat pie’ (local delicacy). En route there are plenty of camper vans, sporting Scotland, Argentine and England flags. 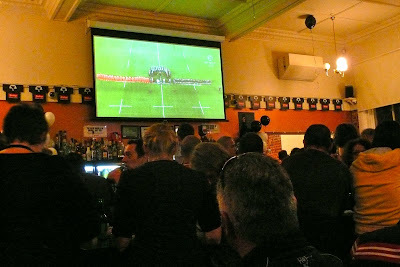 I’m in the small town of Oamaru by mid-afternoon, and by six settled into a great pub, Fat Sally’s, with a roaring fire and good crowd-of-all-nations to eat and watch the opening ceremony in Auckland and the first game, the All Blacks v Tonga. Saturday 10th. Only seventy miles to drive today so I can take it easy, and make some small detours. 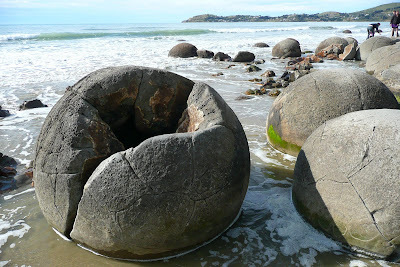 The first is to see the Moeraki Boulders. The photograph is not lifted from the web: it is mine, and really shows what a glorious day it was. Two miles on is the tiny fishing village of Moeraki. When Rick Stein was offered a free trip to anywhere in the world this is where he came, claiming it as his best fish restaurant. http://www.fleursplace.com/ I noted that there are very mixed reports on the Trip Advisor website; perhaps the setting is more impressive than the service. However, you can pass on the food, but the location is idyllic, with tables right on the edge of the tiny bay. 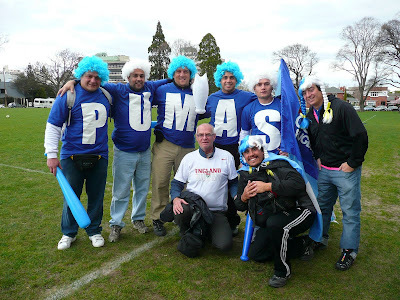 As I near Dunedin the sense of a big rugby festival is apparent. 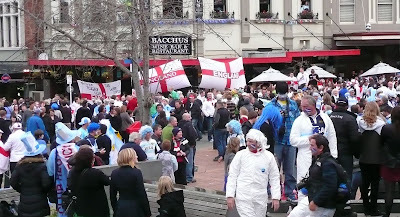 Many premises, commercial and private houses, display messages supporting the All Blacks, with occasionally the flags of other nations. Dunedin has benefitted from the February earthquake, being awarded additional games, one of which is tonight’s England v Argentine. The centre of town is packed, with streets closed, bands revving up the fans, the bars crowded, the locals unsure as to what is happening, and a great party atmosphere. After an hour of this, with two neighbours from my campsite, we head up the street and into the England team hotel to ‘see off our boys’, and then the walk over to the brand new stadium. It is quite a treat, the world’s first indoor rugby stadium, with a permanently closed special plastic roof, which allows sunlight to pass through enabling the grass to grow. Designed by architects Populous (also London 2012’s main stadium) it seats just 33,000 people all of whom seem very close to the action – a necessity in my view, and something missing at Twickenham and Murrayfield. Further, the closed roof really contains the noise and the Argentine fans, of whom there were many thousand, certainly won the cheering and singing competition. As for the match, well the less I say about the dismal England team performance the better: I was very disappointed. Sunday 11th. 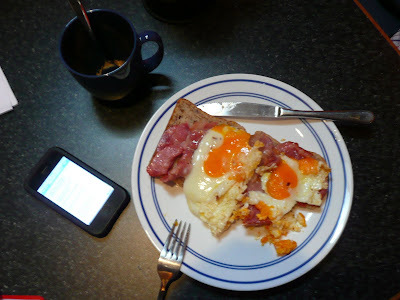 After the frustration of the night I cheer myself up by cooking a tasty fried breakfast, before heading into Dunedin. The nights are cold, with temperatures at around 3 degrees, so I shop for some better thermals. Then a lovely drive east onto the Otago Peninsula, heading to Portobello, all the way along the long shoreline edge of the Otago Harbour. 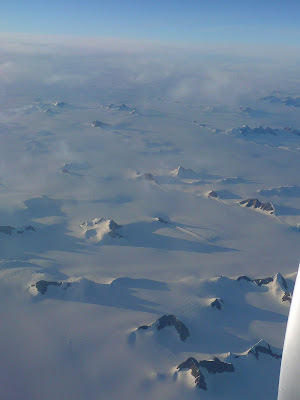 After an hour I turn inland and climb to the ridge, which runs along the length of the Peninsula. 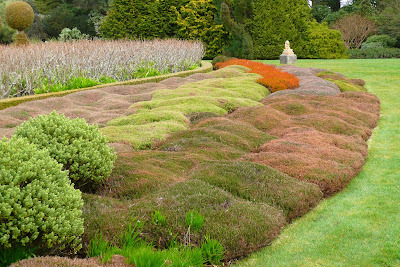 Here I visit Larnach Castle, the only castle in New Zealand. I pass on the interior of the castle but spend a very pleasant two hours walking the gardens, admiring the long range views, and the marvellous planting. My route back to Dunedin is along Highcliff ridge, with the unique sensation of looking on my right down into the Otago Harbour and my left down into the Pacific. Back in the town, it is a quiet Sunday afternoon: most of the 25,000 students are presumably still in bed and I have the Otago Museum almost to myself. The current exhibition is of the work of press photographer Peter Bush who has specialised in rugby, accompanying the All Blacks on their many tours to Britain, South Africa and Australia. Returning to the site it is time to open a bottle of Sauvignon, cook a meal, and settle back with a bunch of fans to watch Wales play South Africa (the current title holders). What a great game, and how close Wales came to winning. What a contrast with the dismal England performance. Overnight there is rain, heavy rain, but I’m snug in my new thermals. Monday 12th. It is time to head south again, towards Invercargill, 150 miles away. I decide to avoid the Highway and turn onto the southern scenic route, which loops around the coast and through The Catlins. I’ve read a lot about this area, not least the warning that “The Catlins has no banks, few petrol stations, very limited options for eating out or grocery shopping”. Much more importantly are the chances to see some waterfalls, seals, bird life, and the rare Yellow Eyed Penguins, one of the world’s rarest with only a few thousand left. But the weather is against me. It is very wet, windy, and from midday I’m driving with lights on, as it is quite dark. When I hit the coast it is really time to ‘shoot through the windscreen’, rather than get out and get the camera wet. Having said that, it’s apparent that the countryside is quite beautiful, and through the windscreen wipers I can make out many fabulous ferns, cordyline, phormiums, and other fine species. 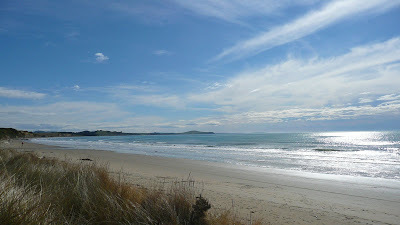 I had planned to free camp around Curio Bay, where during low tide you can see the Petrified Forest, which is 160,000,000 year old Kauri trees, but the wind would be buffeting my van all night so I abandon that idea and head on the final thirty miles, to arrive in Invercargill one night early.